When Sheryl Sandberg’s husband unexpectedly died while on a trip to Mexico, her world turned upside down. Option B: Facing Adversity, Building Resilience, and Finding Joy is her effort to help others find a path through what initially can seem like unrelenting grief, to create a new and fulfilling life when the existence one had hoped for is no longer possible. “I had become a member of a club that no one wants to belong to—a club that I did not even know existed before I joined involuntarily,” Sandberg writes, eloquently describing the grief she experienced when she lost her partner. When the devastating happens—a wildfire takes the house, the factory closes, a spouse suddenly dies, a child receives a terrible medical diagnosis—our lives are transformed in ways we cannot possibly imagine. The loss, despair, and isolation can feel like insurmountable barriers to happiness. Sheryl Sandberg shares her loss experience and partners with Wharton psychologist, Adam Grant, to impart important research on grief, to provide a path forward to those who cannot have the life they dreamed of and worked for. Though this is probably not a book to purchase for a loved one who has suffered a new loss—let them find the book on their own if they are in the early days of their grief—it is a wonderful resource for those who love someone who is grieving. The most difficult thing for the loved ones of those who are in grief and shock is to know what to do or say, how to help. Loved ones hang around the fringes of those suffering, or don’t come around at all, very often because they are afraid to offend and don’t know how to help. This book is an important resource for those who don’t know what to do or say. The book is strong from the beginning. Sandberg and Grant begin the research portion of the book with a discussion of Martin Seligman’s “3 Ps” that can inhibit recovery from grief: personalization, pervasiveness, and permanence. Those who are grieving can feel like they caused their grief, though that is very rarely the case. They can believe that everything is awful as grief overshadows the better, still enjoyable parts of life—like a witty joke or the beauty of a flower touched by rain. They can feel that the grief will be unending, and though it will change the trajectory of their life and in some ways the loss will always be present, the depth of grief will change and lighten over time. If we can help the grieving person experience that grief changes, that the horrors of early grieving don’t last forever, we can help them to see that life will not only go on, but at some point can become good again. In what is perhaps the loveliest chapter in the book, Sandberg and Grant discuss the “elephant in the room.” When loss is experienced, the grief and isolation are compounded when the grieving person is not asked how they are. Rather than making it taboo to talk about the problem, friends and family should address the issue head-on and take their lead from the person who is troubled, allowing them to share, or not, as they need to. That said, Sandberg and Grant also point out that the grieving person has a responsibility to answer honestly. If given an opening to talk, don’t keep your feelings to yourself. When your loved one gives you an opening, they very likely can handle anything you share—and support you in your process. The book is filled with gems like these examples. It is quality research grounded in real-world experience. There are, however, problems with the book, the most glaring of which is privilege. To Sandberg’s credit, she directly addresses this issue, albeit inadequately. She recognizes her privilege. She “only” has to deal with the grief of losing her beloved partner and raising their children without him. She is not in danger of losing her job, home, or support system. In Sandberg’s world, friends fly across the country on a moment’s notice to be of support, parents take weeks off to move in, nannies can be hired, and vacations most people only dream of are gifted. Sandberg has pushed for and gotten “bereavement” leave for Facebook employees. Most of the rest of the country is still fighting for a living wage and paid maternity leave. There is a disconnect with most of the nation’s reality that permeates the book. Does Sandberg’s privilege disqualify her from writing about “raising resilient kids” or “failing and learning at work?” Is Grant’s research somehow invalidated by privilege? Perhaps. If you have a white-collar job at a place like Facebook, you probably can “fail and learn” while on the job and you and your coworkers might grow from the experience. But a plumber who owns his own business is going to go to work the day after his wife dies because he needs to put food on the table. A factory worker or hotel housekeeper doesn’t have the luxury of being irreplaceable. Life circumstance can make it much more difficult to find your joy again after loss, particularly when you don’t have the kind of privilege Sandberg has. For some, the first loss is the initial step in a downward spiral. Option B can fly by as quickly as Option A did. 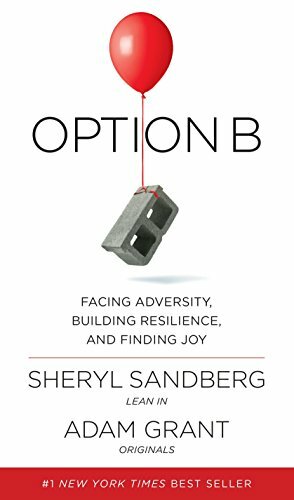 Option B: Facing Adversity, Building Resilience, and Finding Joy will be a bestseller that informs grief counseling and community support for a long time. As well it should. Yes, Sandberg is privileged, but that does not discount her very real suffering or the quality research, presented by Grant, into the ways in which we can support people who are grieving. Option B brings light into the darkness of human suffering, and for that, it should be lauded.